This recipe I combines the fruity, citrusy, and herbal taste of the salad with the fresh spicy flavor of the prawns. This creates a mouthwatering flavor of “Summer Time” which you can enjoy when sitting outside and when friends are over. Serving this appetizer in spoons or on small plates or glasses makes this a casual, light, and enjoyable experience. Best enjoyed with Golden Drop Medium Wine. If you use frozen prawns, defrost them before you start cooking. This takes about 2 hours if you leave them outside at room temperature. Wash the herbs, spring onions, chilli, and lemon. Peel the prawns (must be defrosted if they were frozen) and rinse them under cold water. If they still have the black intestines, remove them before rinsing by cutting the prawns lengthwise on the back and pulling out the intestines. Cut the chilli open, remove the seeds and discard them, and then chop the chilli very thinly. Using a Tupperware or bowl, combine the prawns, chopped chilli, sesame seeds, and sesame oil. Season with salt and pepper and store in the fridge until later. Before serving, heat a grilling pan and grill the prawns on each side for about 2 minutes. You can do this also on your grill or barbecue outside. 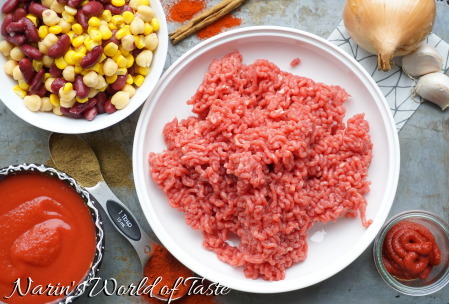 With Chili Con Carne you can never go wrong. It’s great as a midnight dish if you’re having a big party e.g. for New Year’s eve, and it’s also one of my kid’s favorite foods. Is a good source of nutrition for their weekday meals and very easy and quick to prepare. 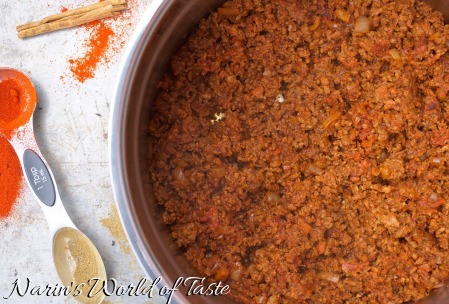 I love to add cumin and cinnamon because it creates a very nice flavor. Begin by draining the glasses of the cooked chickpeas, kidney beans, and sweetcorn with a large sieve. Peel the onion and cloves of garlic and chop them thinly. Now heat 2 tbsp olive oil or butter in a large pot and add the chopped onions and cloves of garlic. Let them brown slightly by stirring continuously. Add the tomato paste, chilli powder, paprika powder, and cumin. Stir continuously until the paste becomes a bit darker in color. 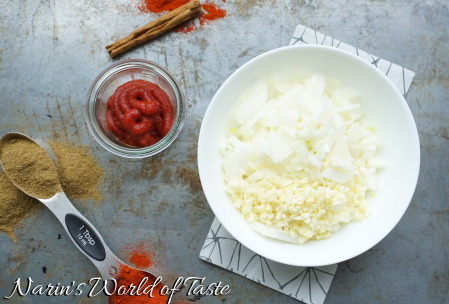 This step is very important to get all the flavors out of your spices. Once this has happened, add the ground beef and season with salt and pepper. Stir regularly until it is cooked. Add the tomato paste, water and cinnamon stick, combine everything and let it simmer for about 30 minutes. Then pour in the drained chickpeas, kidney beans, and sweetcorn and simmer again on low heat for about 1 – 1.5 hours. The Chili Con Carne becomes even better after a day or two. 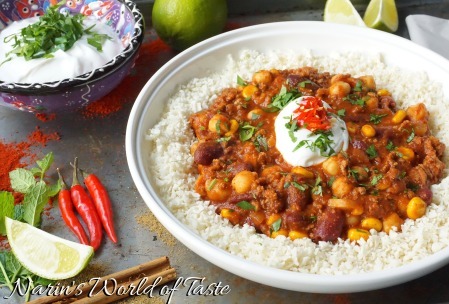 Serve the Chili Con Carne on a plate with rice, cauliflower rice, and/or chickpea flatbread. Garnish with sour cream, chopped chilies, lime wedges, and sprinkle some chopped coriander on top.